Assam Rifles Recruitment Rally: 91 Posts of Clerk, PA, Barber, Washerman, Cook, etc. 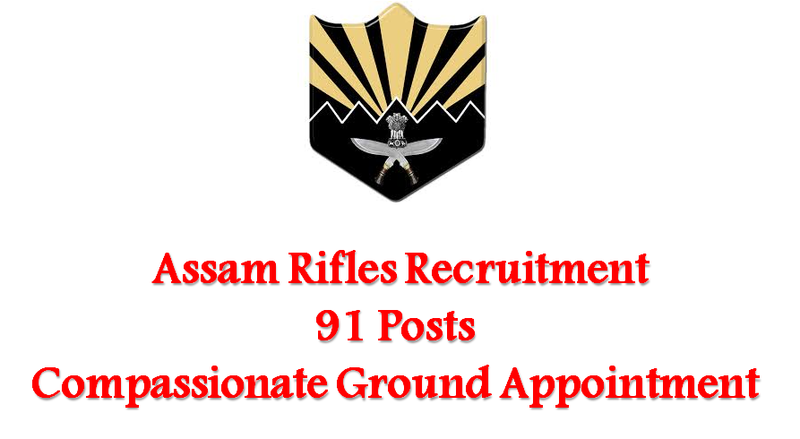 Assam Rifles has begun recruitment rally for compassionate ground appointment against 91 available vacancies. The rally will be held at Shillong, Meghalaya NRS Guwahati from 28 February onwards. Army job aspirants should start applying for Assam Rifles recruitment rally right away as the last date of application is 04 February 2017. For candidates belonging to far flung areas the last date for submission is extended till 20 February (Details of all the States for which extended last date is applicable can be found from the link given below). Who can apply through compassionate ground recruitment scheme? Only the next of kins (NOKs) or dependents of Assam Rifles Personnel who have died while in service or discharged from service on medical grounds or missing can apply for compassionate ground recruitment. Spouse or married/ unmarried son (including adopted son) or daughter (including adopted daughter) or brother or sister in the case of unmarried govt employee who has wholly dependent on him at the time of death in harness or retirement on medical grounds, as the case may be constitute dependent family member. Other eligibility criteria include physical standards. The prescribed height for males is 170 cms, and it is 157 cms for females. Only for male applicants, the unexpanded chest must be 80 cms and a minimum of 5cms chest expansion is needed. Weight, for both the gender, will be proportionate to height and age as per medical standards. Relaxations are available to candidates belonging to specific regions/ areas. Candidates will be selected on the basis of their performance in physical efficiency test and trade test. Candidates applying under the scheme of Compassionate Ground Appointment will be exempted from written exam test. It is important for the candidates to have knowledge about the initial ranks of the posts/ trades for which they are applying.